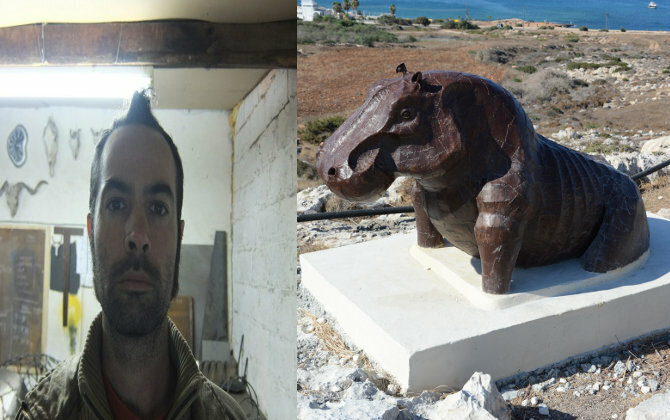 Alex Welch was Inspired by nature and the many forms of it, he used its endless curiosities as a base for my sculptures. He created exaggerated forms with a strong skeletal base, combining materials and textures. He worked in steel, ferrous and non ferrous metals, traditional hot forged iron, glass and various other materials, to create sculptures, functional pieces and installations. He liked to experiment wherever possible, exploring the materials and their possibilities, refining his methods and exploring new ones, in order to broaden his artistic practice and create new and intriguing works of art which are at the same time both familiar and alien to the viewer. Exodus music festival, Limassol, Cyprus - Site specific installation 2014. Title of the project: "HIPPOPOTAMUS"
Concept: The hippopotamus being ancient greek for horse of the river , i thought i would give it a tough of horse , elegance , and a little more muscle tone .